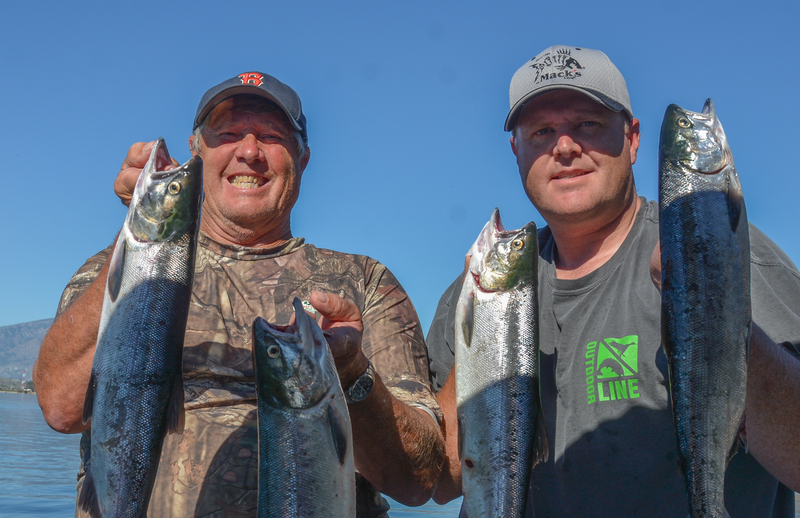 5 Tips for Brewster Sockeye! 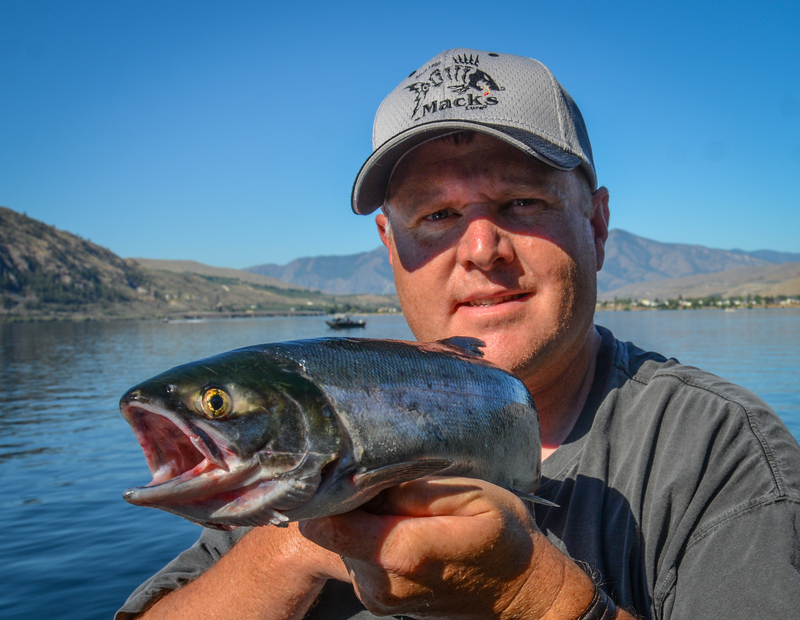 With the summer heat setting in and water temperatures rising the Okanogan river is too warm for the Lake Osoyoos Sockeye to migrate. This means that as the fish stack up in Columbia river at the famed Brewster Pool you can easily catch these tasty fish. Here are a few tips to be more successful at catching Red salmon bound for the Maple Leaf to the north. Short leaders. The number one “must” is to keep your leader short between the dodger and the lure. Imparting action onto a lure is hard to do at slow speeds and this is where the short and stiff leader makes the difference. Tie your leaders with twenty to twenty-five-pound monofilament between nine and twelve inches. Any longer than that the lure won’t “whip” around which is needed to get these fish to bite. Speed must be slow. Troll as slow as you can and still have the dodger work back and forth which imparts action on the lure. One reason why you want to troll slow is that these fish are tired and won’t chase down your gear. For Brewster the ideal speed is .7 to 1.2 mph. Use a drift sock to slow you down if you need to. Fish the shadows. Once the sun hits the water you will notice a distinctive shadow near shore. The fish will move into the shadow and you need to move there too. A “bite” will occur as the sun hits the water and it will seem for about a half an hour that just about everyone will be fighting a fish, then it all goes dead in a matter of an instant. In reality the fish just moved to stay out of the sunlight. Use the right gear. 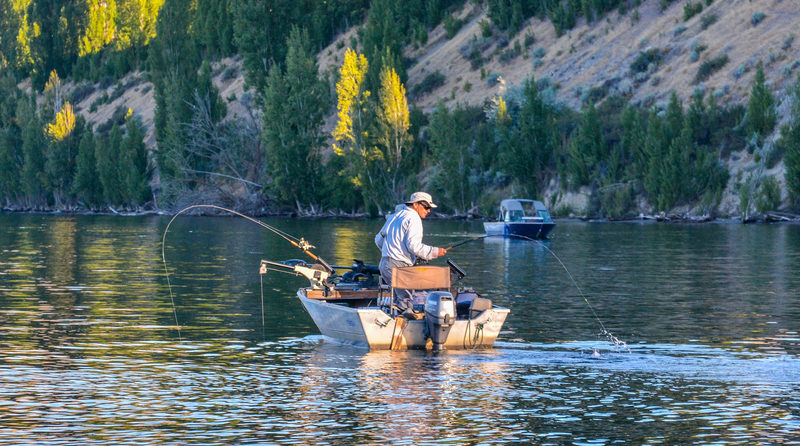 Light action rods that are long, such as noodle rods or lightweight steelhead rods will land you more fish. 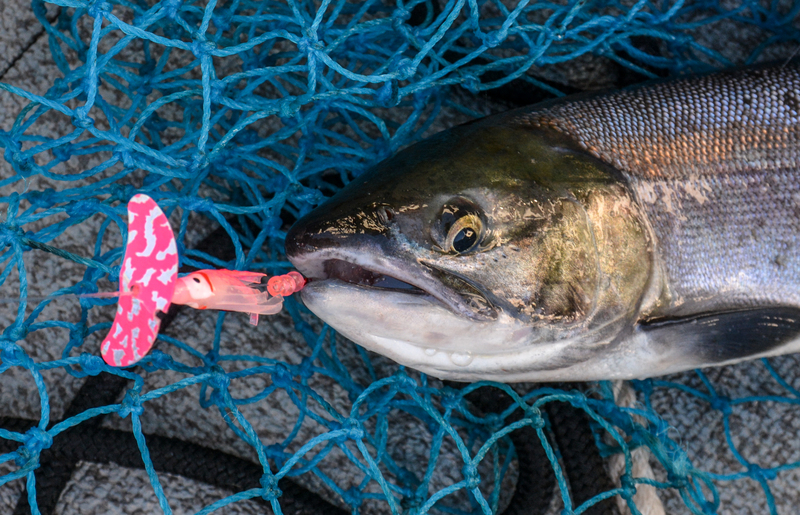 Mack’s Lure Double D Dodger trailing a Mack’s Smile Blade Sockeye rig or Cha Cha Sockeye rig is hard to beat. This company is based in Wenatchee and does extensive testing on Sockeye gear just for this fishery. If you use a dropper weight make sure you use a three foot buffer between your slider and the dodger to allow the dodger to work properly. Scent and bait. This is a must as it will cause hesitant fish to bite. 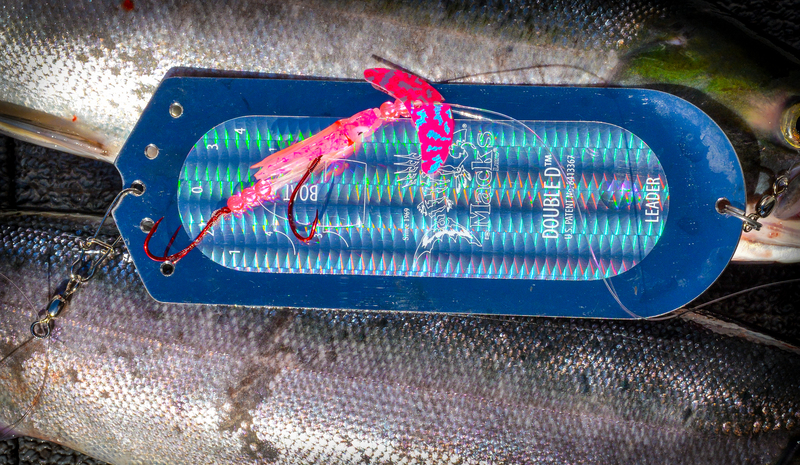 Use Pro-Cure shrimp, krill, or kokanee Super Gel’s liberally on your gear. Also tip the front hook with a cured coonstripe shrimp or just the tail if the shrimp size is too large. If you buy your bait look at the jar and see the size of the shrimp and try and purchase a jar that has a lot of smaller sized baits. 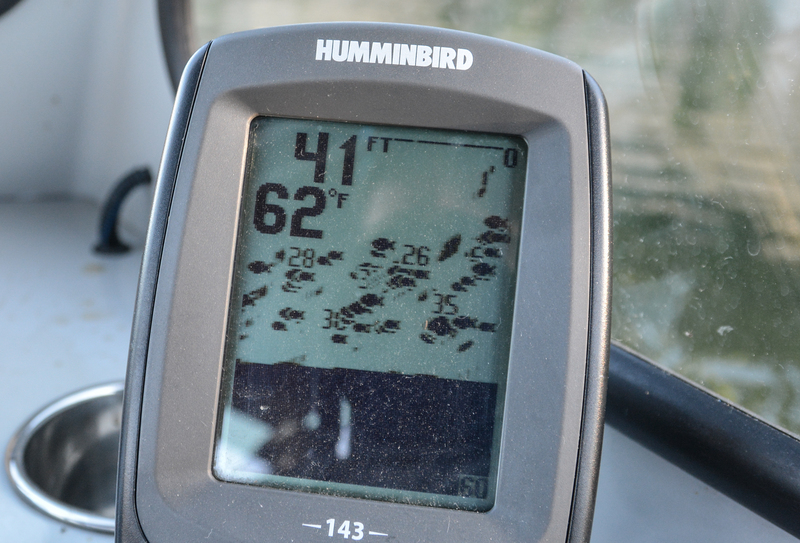 These fish don’t fight hard, until they see the boat. Expect to lose a few and be ready with a long handled net. Get there early as the summer heat will drive you off the water by mid-morning. Hardly anyone is fishing after 10 o’clock because it is too hot out to enjoy the day. Fish at first light then go enjoy the day in the shade. There is a lot to do in the surrounding area and be sure to take the time to visit and help out the local economy. One of the best tasting salmon of the Pacific Northwest. Even with the fish that have traveled hundreds of miles up the Columbia River the Sockeye caught near Brewster cut very fine. They are a great fish for baking or smoking. 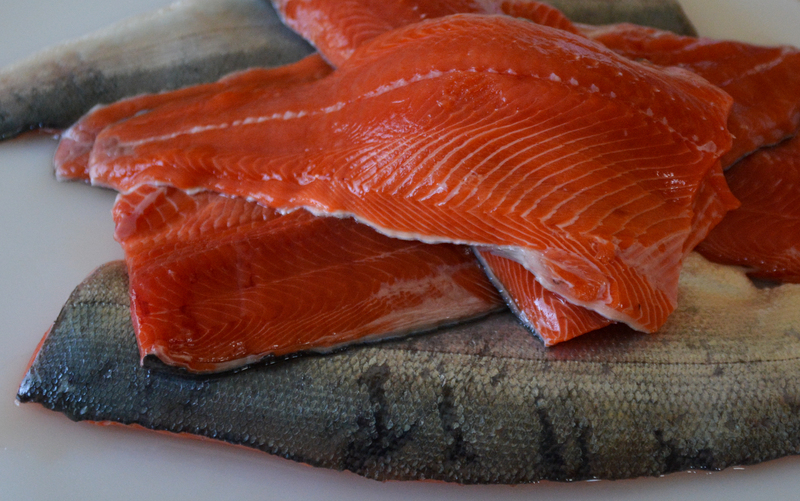 Enjoy summer’s bounty and catch some Sockeye! What are some good campsites nearby?